Nintendo’s next big thing isn’t a video game or a video game console. 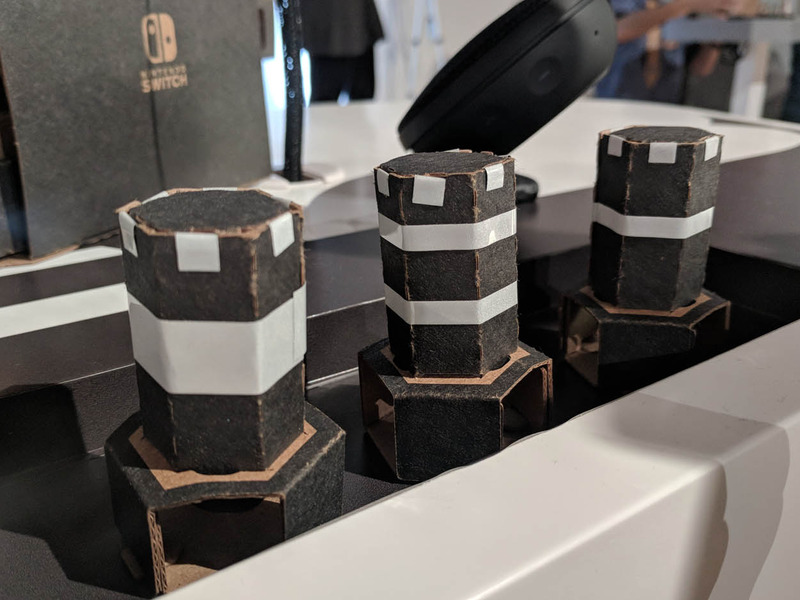 Ben Gilbert/Business InsiderThis is one of several ‘Toy-Con’ creations that can be built with the starter set of Nintendo Labo. 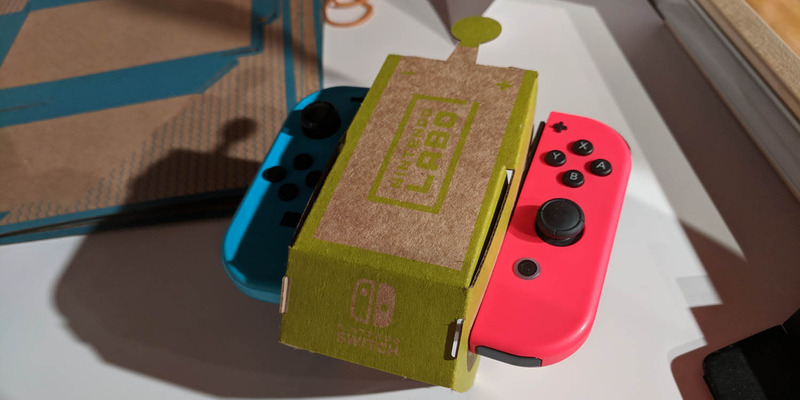 Nintendo “Labo” – pronounced “lab-oh,” like “laboratory” – is an entirely new concept from the quirky Japanese gaming powerhouse. 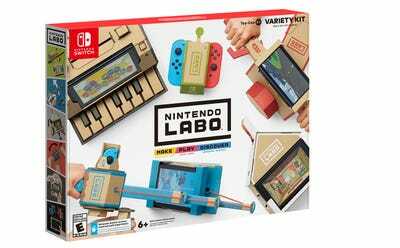 Starting at $US70, you get a kit full of buildable cardboard toys to complement the wildly popular Nintendo Switch console. There are games, of course, which are included in the package. More importantly, there are step-by-step instructions for building each of the toys in the set. Think: Lego meets model aeroplanes, but more fun. 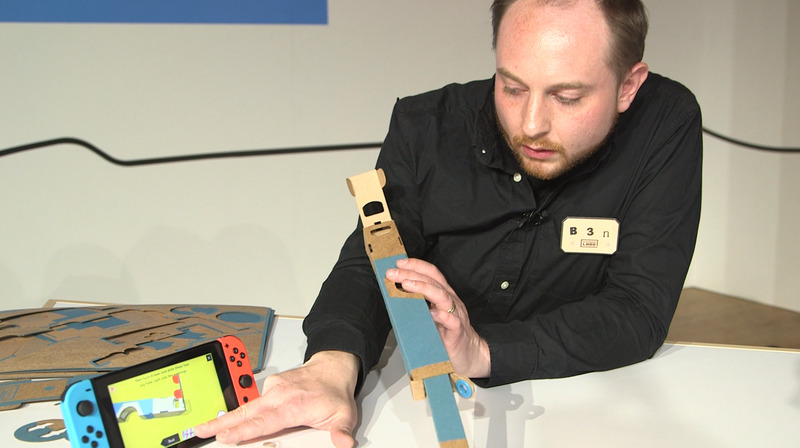 I got to try Nintendo Labo back in February ahead of its launch on April 20. What I found was a surprisingly brilliant learning tool aimed at kids growing up in a digital world. 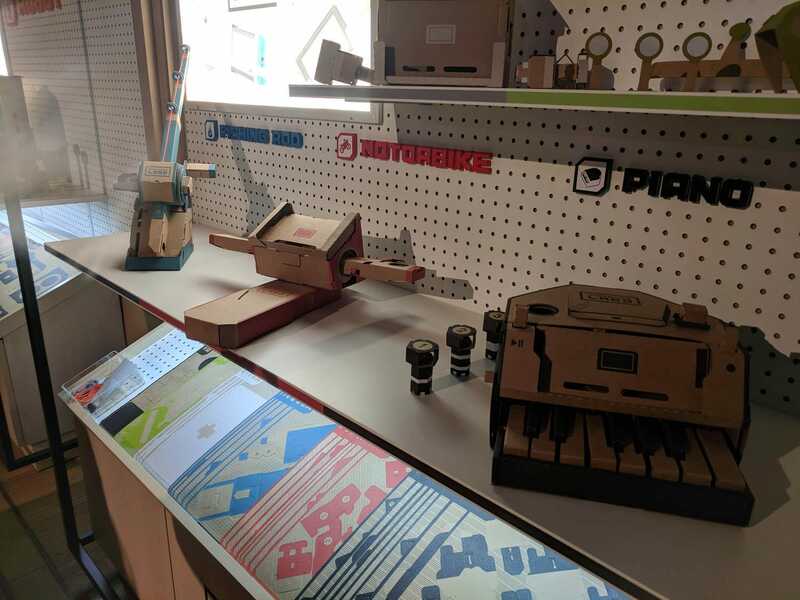 The $US70 “Variety Kit,” seen above, is the base level for Nintendo Labo; an $US80 “Robot Kit” is also available, which contains a large and complicated robot suit. There are two main aspects to Labo: Building with cardboard, and then using those creations to play Labo games on the Nintendo Switch. It’s important to note here that you need a Nintendo Switch to play Nintendo Labo games. 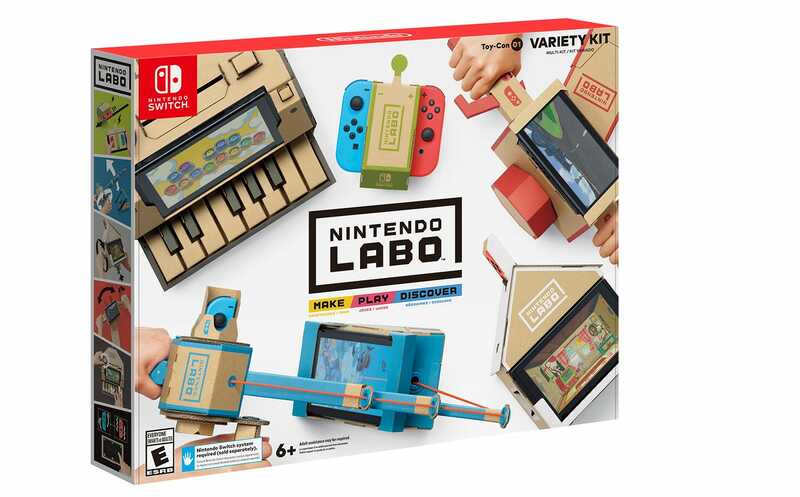 Think of Labo as essentially a game for the Switch that comes with buildable toys, (though that’s underselling it). In the Variety Kit, there are several different devices to build. I got to try building an RC Car and a fishing pole. 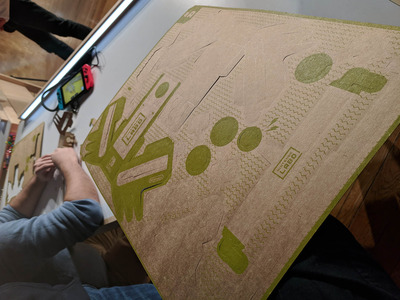 Each Labo build begins with a large sheet of relatively thin cardboard. The cardboard doesn’t feel especially tough, but the final creations made with the cardboard are tougher than you’d think. The RC Car, for instance, begins with the sheet of cardboard seen above. Various shapes are perforated from the cardboard, which get punched out per a set of very charming instructions. You could, of course, just punch out everything immediately – and some people assuredly will do that, especially little kids. That’s fine. The instructions will still identify each piece and explain how they all fit together. Labo, as I discovered, is tremendously forgiving. Just like cardboard! That’s kind of the point. I cannot say enough positive things about the instructions. They’re classic Nintendo. The process of building Nintendo Labo is similar to building Lego. You’ve got all the right pieces, and an idea of what the final design should look like – there are instructions, and you follow them. But with Labo, Nintendo’s deft hand for presentation and charm is evident. 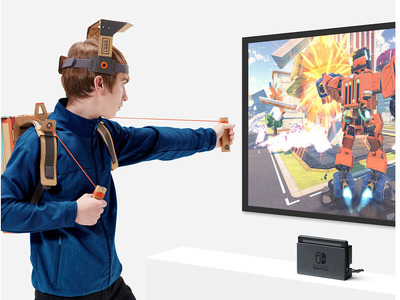 You may notice a Switch console pictured above – on it, instructions for how to build this particular Labo are displayed. The pieces of cardboard you’re supposed to be using are displayed, and they are rotatable. You can zoom in or out, and you’re given direct control of the animations that play out – hold down the button to see the animation, or to rewind it. After the pieces of cardboard are punched out, they need to be moulded into whatever object you’re creating. For many of the simplest Labo, that means a lot of pre-folding, which will help condition various pieces of cardboard before they’re folded together. Best of all: There’s no rush! Labo is about the joy of creation, and the knowledge that experience brings. Ben Gilbert/Business InsiderThe Variety Kit comes with five different ‘Toy-Con’ creations, including a piano, a fishing rod, a house, a motorbike, and two RC cars. The spirit of Nintendo Labo is the same one that drives model aeroplane building, or ham radio creation, or even PC construction. There’s no rush with Labo, or competition. It’s about the experience of building something, which is fundamentally a learning process. The entire experience feels centered on teaching foundational concepts: following a set of instructions, using spacial identification, logically deducing where the instructions are going, and much more. 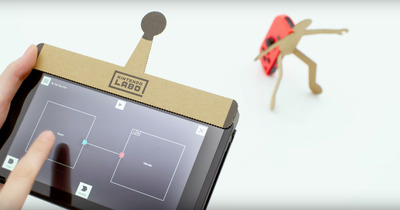 In the same way that building a birdhouse teaches a variety of broad concepts, so does Labo – but updated significantly for a generation born into smartphones. Labo does a ton of neat stuff using the Switch’s technology. Much of what makes Labo so cool is what you can do with it after you build it. As you can see above, the “RC car” is actually this bug-looking thing. By using the vibration of the Nintendo Switch controllers (the “Joy-Con”), the “car” rattles along the hard surface. 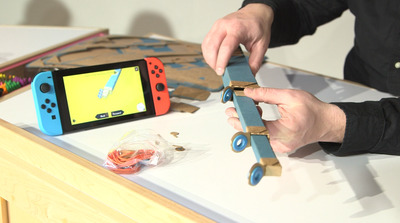 The way the cardboard creations (“Toy-Con”) come to life is by adding in various components of the Nintendo Switch – either the Joy-Con controllers or the console itself (the tablet). It looks like it wouldn’t work, right? It totally works. More amazing, the “car” has a little window in front where an infrared camera points out. It can respond to heat (read: your hand), or a variety of sensors that come with the kit. 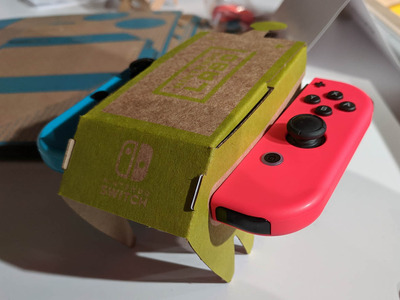 The use of the Switch controller’s IR camera is prevalent throughout the varios Labo creations – a relatively low-tech solution that lends a surprising amount of high-tech magic to what is otherwise a neat cardboard construction. The RC car is nothing compared to the piano, which is a functioning piano that feels like a magic device. 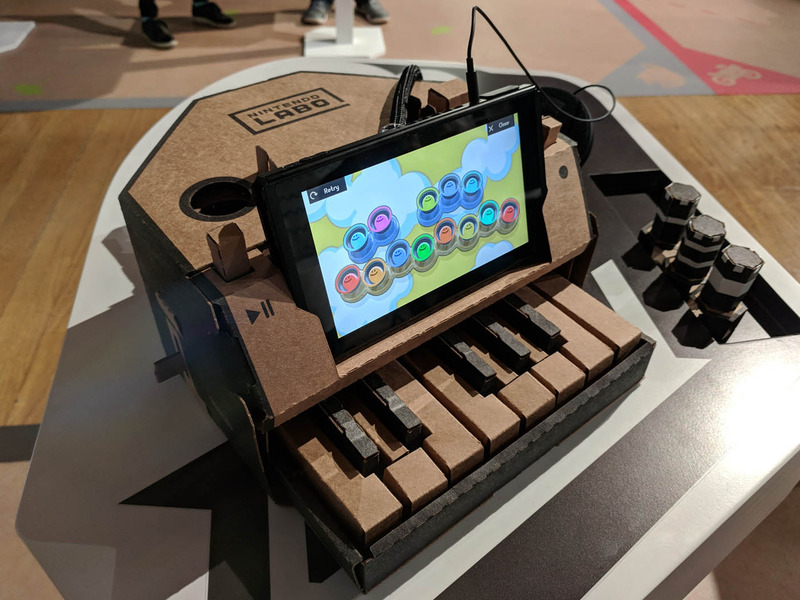 The coolest thing I did at the Nintendo Labo event, by a long shot, was play this cardboard piano. It’s one of the five Labo creations you can make using the Variety Kit, and it’s incredibly impressive. The tape on each one tells the Switch to change the tone from the piano keys. They can also be twisted while inserted, which changes the pitch. It feels like Google Cardboard for digital music production – it’s basically a cardboard MPK Mini. 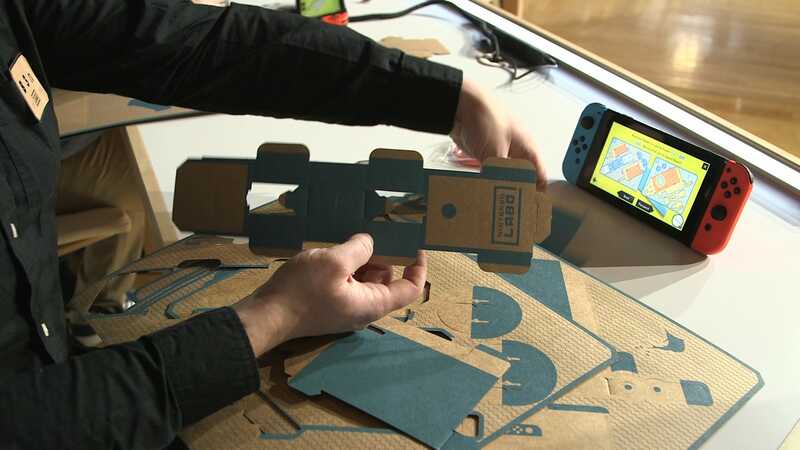 Nintendo Labo is definitely intended for kids, and especially as a shared project for parents and kids. That said, adults shouldn’t ignore Labo. 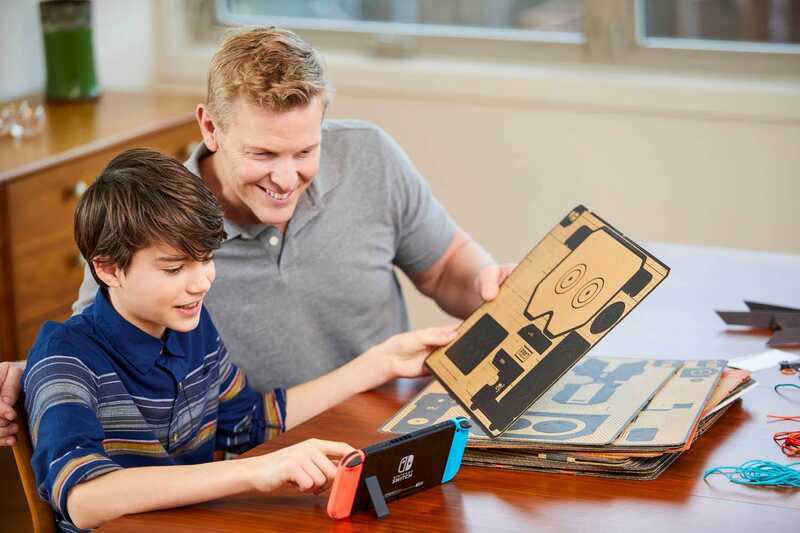 If you’re a parent with a Nintendo Switch, Labo is a no-brainer. It’s a sneaky way of teaching your kids a bunch of important stuff while having a good time! Win-win! But what about the folks who grabbed Switch for “Zelda”? Labo is almost certainly for you as well. Though some of the creations are simple, many of them are far more involved. The fishing pole uses washers and grommets! You – adult human, presumably who has built things before – will still have to work at building Labo’s more detailed Toy-Con constructions. It will take time and brain power. If you’re anything like me, you’ll delight in the process. Building Labo is fun! I was disappointed to learn that I couldn’t take my creations home with me. More than just building and playing with the Labo designs from Nintendo, there’s a way to re-program your Switch with Labo to do completely unique things. A software tool called “Toy-Con Garage” was shown at the event. The premise of the tool is basic programming. Maybe you want the left Joy-Con to vibrate when you tap on the Switch screen, for instance. 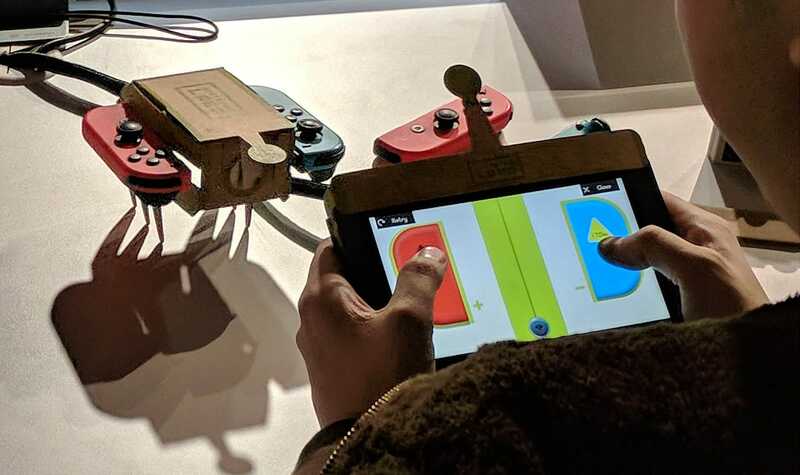 Or maybe – as was the case at the event – you want the Switch screen to act as a kind of guitar that’s placed in the middle of a cardboard guitar. The point is that, beyond just the creations Nintendo has proposed, you’re able to re-program the console as you wish. There’s a level of depth to Labo that undercuts the simplicity of its appearance. It’s a toy construction set, and a set of video games, and a STEM learning device. It’s something new from Nintendo that also feels entirely famililar.